The Colombian-born hermit-monk Dario Escobar, who resides in the Qaddisha Vally in Lebanon, has been profiled in this blog before; here he is profiled in National Geographic Australia. Escobar is now 83 years of age. Profiled years ago on this site (http://hermitary.com/around/?p=456) is Columbian-born Orthodox monk and hermit living in the Qadisha Valley, Lebanon. StepFeed, a Middle Eastern website, updates Escobar with news and photos. Fr. Dario Escobar, Colombian-born hermit living in Lebanon’s Kaddisha Valley, is profiled in a 2-minute AFP video titled “Hermit Finds Heaven in Lebanese Cave.” A related AFP article offers more detail, with several photos. Still another article about Fr. Escobar, with more personal details, in the Lebanon website Tayyar, by visitors. On a mountain overlooking the Mediterranean near Beirut, a hermit rises at three in the morning, reaching for a flashlight amid the lumpy familiarity of books that are both his life’s work and his lifelong bedmates. The hermit, who’s 73, long-bearded, and known by the name Father Yuhanna, works there until dawn, translating ancient Christian hymns from Aramaic, the language of Jesus, into modern Arabic, copying them into a giant, leatherbound volume the size of a seat cushion. Then he prays, eats a piece of fruit, pulls on his black habit and cloak, and merrily sets off to deliver 10,000 blessings to every place in the world. His first stop, always, is Alaska, where he “stocks up on fresh air.” Then he drifts down through North and South America, jumps to Africa, moves up through the Middle East, sweeps across Europe, then heads east into Russia and Asia before working his way south to Australia. Everywhere he goes, he distributes blessings, counting them off one by one on a string of woven rosary beads that fly through his fingers like doves. This daily trip takes three or four hours, and most days—if he doesn’t linger too long over the trouble spots—he’s back home by noon. To the untrained eye, he’s just an old man walking around in a garden. To his friends and followers, who come by the hundreds to hear his teachings about Jesus, he’s a saintly figure, a descendant of influential hermits like Simeon the Elder—a fifth-century ascetic who lived atop a stone pillar in the Syrian countryside for more than 30 years, attracting the pious devotion of locals. Another article on Fr. Dario, the Colombian-born hermit in Lebanon, this one from a local angle, a little more personable. 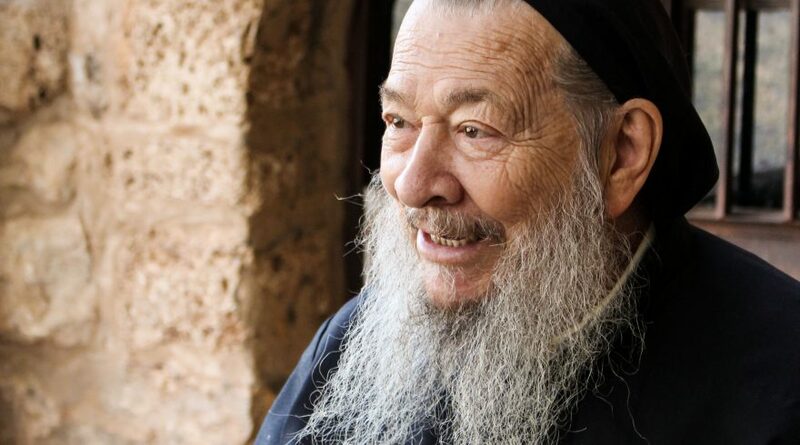 Time correspondent Andrew Lee Butters records an encounter with hermit and Maronite priest Fr. Dario Escobar in the Qaddisha Valley of Lebanon. (Fr. Dario was profiled in “Hermits around the web” in May 2007.) Butters titles his blog entry “How to Talk with a Hermit,” which, he discovered, was simply to knock on his door. The author did not get any gnostic bits of wisdom but rather a simple statement from the hermit: “Many people come here because they think I know the future,” he said. “I only know one thing: that we all will die.” Includes a photo of Fr. Dario.